As I was listening to Aaron Copland's "Appalachian Spring," I realized how much he used woodwinds and strings. It evoked memories of Appalachia, feeling again the gentle quality of springtime, especially the rains. Sara Teasdale said it well, "There will come soft rains, and the smell of the ground." Living now in the Above the Rim, I suspect that if Mr. Copland were alive today to compose music about monsoons in the High Country, he would use trumpets, trombones, coronets, bugles, snare drums, cymbals, and timpani, to evoke the experience of Flagstaff's weather. Surely, no mellow French horns or saxophones, but instead, the introductory fanfare to Richard Strauss's tone poem "Also Sprach Zarathustra," made popular in 2001: A Space Odyssey. 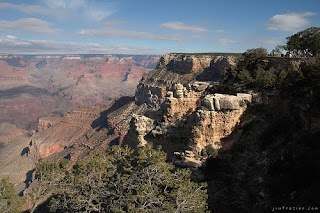 Weather in the Southwest is a bit brassy which befits the stark beauty of the landscape. 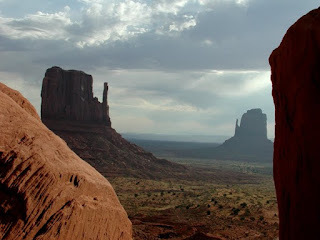 The Grand Canyon and Monument Valley are neither gentle nor mellow but evoke rather a sense of grandeur and awe. Rudyard Kipling might well have written of the Colorado Plateau as he did of Mandalay's bay where "dawn comes up like thunder." 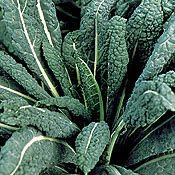 While kale doesn't "come up like thunder outer China 'crost the Bay," it does very well in weather both stark and demanding. It's even usable after a shot of hail because even though it's perforated, it's still usable, holes and all, its nutritional efficacy not relying on its beauty. Whole Foods claims that kale is the most efficient of vegetables in a calorie and nutrient ratio. In other words, with kale the gardener and the gourmet get more nutrients for the least amount of calories, more bang for the buck. Often the color of battleship grey, as the dreadnought of vegetables, kale even gets better when nipped with frost. Crambe contra mundum. which means that it's just great for Flagstaff, taking advantage of our cool climate. It can be planted early, may even limp through our summers, is refreshed by the cool of autumn, and marches like a soldier straight into the first snowfall. What more could a gardener and a gourmet ask for than a vegetable jammed with nutrients, low in calories, which is easy to grow in Flagstaff? Edibility. We are rescued by a low country native from New Orleans of Cajun heritage, the diva of Coconino County's Democratic Party, Harriet Young, who can make Brussels sprouts, palatable, even, tasty. Her recipe is simple. Olive oil, two cloves of garlic mashed and chopped, ½ onion chopped, water, lemon, salt and pepper. Sauté onion in olive oil, add garlic and kale and continue to sauté, add water and steam until tender. Add zing with juice from ½ lemon. Salt and pepper. 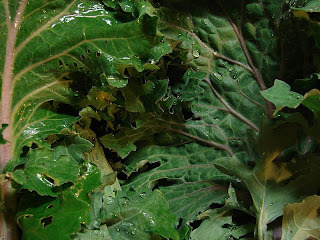 Recipes from Republicans, Independents, and Libertarians, as well as fellow Anarchists are welcome for a database of kale recipes to be available ecumenically online at http://oldfartskitchen.blogspot.com. 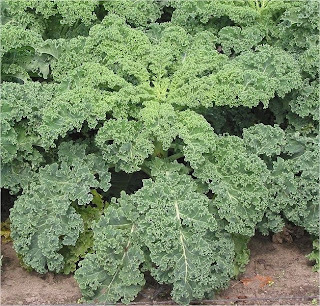 Kale appears in three forms with variations, Russian, Italian, and Scots. Foodie snobs prefer the Italian or Tuscan kale. Scots kale is kilted with ruffles, and Russian is red with a broad leaf. For what it's worth, which is not much, I prefer the Russian largely because it's easier to use with its broad leaf. The foodies claim that the Italian tastes better, but since my taste buds suffer from a wasted youth of fastfood salt abuse, beginning with Bob's Big Boy, I can't tell. Like dill, kale grows almost like a weed. I've had volunteers all over my flower and vegetable beds from previous plantings. It can be seeded outdoors when the temperature of the soil is 45º F. or indoors six weeks before the last frost and transplanted when the danger of frost is past. Since outdoors is so easy, transplantation is a waste of energy. A warning: aphids like kale. The best antidote is the garden hose's nozzle. Turn it down and blast away at ground level, the beasties savoring the underside of the leaves. It may take several applications. If that doesn't work, try insecticidal soap, but wash it off before eating. 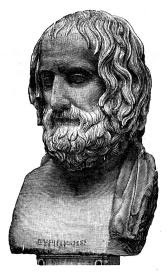 As Euripides said, "Whom the gods would destroy, they first make mad." Stay sane. Eat kale.